Welcoming Polt to Vietnam, Ngan said his visit will consolidate and enhance the relations between Vietnam and Hungary, particularly in the judicial area. She also highly spoke of the two countries’ long-standing friendship and multifaceted cooperation which have flourished since they set up diplomatic ties nearly seven decades ago. Hungary has provided tremendous support for Vietnam during its struggle for national independence in the past as well as at present national safeguarding and building, she said, noting that thousands of Vietnamese students were trained in Hungary, many of whom now hold important positions at governmental organisations. She highlighted Hungary’s continued support for Vietnam today as Vietnam is viewed as its key partner in Southeast Asia. 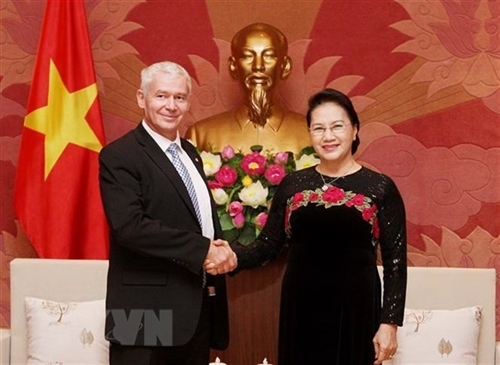 Polt, for his part, said he is happy to visit Vietnam for the second time, while hailing the official visit of General Secretary of the Communist Party of Vietnam Nguyen Phu Trong to Hungary last week, during which the two countries lifted their relations to the level of Comprehensive Partnership. He also updated his host on the results of his meeting with leaders of the Supreme People’s Procuracy of Vietnam, saying that the two sides agreed to be each other’s strategic partners and expand their collaboration in the prevention of high-tech and economic crimes and corruption. They will also foster joint personnel training and build strategies for development. Delighted at the news, Ngan said she expects the cooperation between the two supreme procuracies will continue to grow in the future and hopes that both sides will increase delegation exchanges to share experience and learn from one another. Polt agreed with Ngan, saying that Hungary will double the number of scholarships offered to Vietnamese procuratorial officials looking to study in the European country. Vietnam and Hungary established diplomatic ties on February 3, 1950. Over the past few years, active progress has been made in the bilateral relations, with high political trust and a regular exchange of delegations, especially at high levels through Party, Government, National Assembly, and local channels. The bilateral ties have seen significant progress in law-making, justice, national defence-security, healthcare, education-training, and partnership between localities.